Fencing is sword fighting. The original European Martial art. It is the modern sport through which all those romantics, with the soul of a D’Artagnan or of a Zorro, can end up as athletes and competitors in a compelling game! Fencing is for everyone, but unfortunately, we fencers, and you the public are both suffering from the false opinion that ours is an elite and expensive sport; only indulged in by the privileged. We suffer because this opinion restricts the number of new recruits to our favourite sport, and you, the public, are missing out because it is an accessible and very rewarding one. The idea of it being a rather elegant and elite pastime is a hang over of an idealistic 19th century one, and that is just no longer compatible with the modern game. Though still occasionally elegant it is also noisy, demanding both emotionally and physically, dramatic, aggressive, and open to everyone. The players who come to the fencing salles, do so from all walks of life. Because it is as much a mental game as a physical one: old hands can still retain their superiority over younger, fitter newcomers by skill (although a small caveat is that some level of fitness is necessary to start comfortably- see health issues). Fencing as a true sport (i.e. not combat training) did not appear until the 17th century (see our history page) but as an art of defence the skills have been taught for over a thousand years. In mediaeval Britain the level of brawling between swordsmen in taverns got to such a level of public nuisance that in 1285 King Edward I banned the teaching of fencing within the city of London; most people considering fencers no better than vagabonds, actors and other social misfits! Eventually, partly due to martial necessity and partly national pride, good King Henry VIII revoked this ban with the formation of the British Academy of Fencing in 1540. This, in its present guise of its 1949 revival, is the basis for the modern school, still being the body that instructs the instructors. Now that we are in the early days of the 21st Century it can be seen that London has so many clubs, it is possible to fence somewhere, at any level, on any given day! 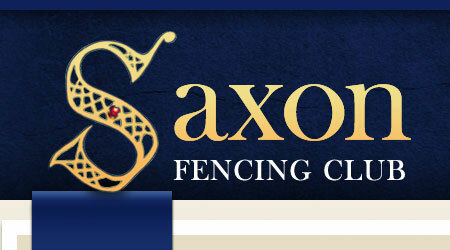 Saxon Fencing Club is just one of these many. If you find Saxon Fencing Club is not the most convenient for you, British Fencing Association will put you onto a club closets to you. When you start, you do so with the Foil. This is the first of the three fencing weapons: the foil, the épée, and the sabre (see our glossary and weapons page for full rule differences). The practice being that the rules and etiquette of the foil serve well as a foundation for the other two. Foil is the oldest weapon, being first described in 17th Century France. In foil bouts fencers are bound by a rule of “right of way”, very similar to tennis in that one can only score on a service. Originally this was introduced to encourage hits to be made without the risk of being hit: very useful in a dueling situation. The confined target area for foil is also a hang over from the old needs of defence, as it is the trunk of the body, i.e. where the most damage is done. After the Napoleonic wars these same rules where applied to the military’s favourite dashing cut-and-thrust weapon the sabre, just then appearing as a sport weapon. However the target area for sabre also included the head and arms. Again in these times, more serious swordsmen wished to emulated (if not train for) the illegal but still prevalent field of honour: in other words the Duel. This made the creation of the épée, the heaviest of the three sports weapon, with no rules of right-of-way and all the body as target. Simply put, this is the nearest to a real sword fight one can get with safety. Each of these three weapons though superficially similar is very different, and each has their own devotees. But they all require the same high degree of mental and physical agility that is the real personal gain of a commitment to this sport. Once you have got the bug you will never stop. There are people still fencing in their eighties! Just as talent, fitness and dedication can bring the early success, so skill and cunning can keep you at the top of a fascinating sport for a lifetime! So come along and give it a go, visit our beginner’s guide.